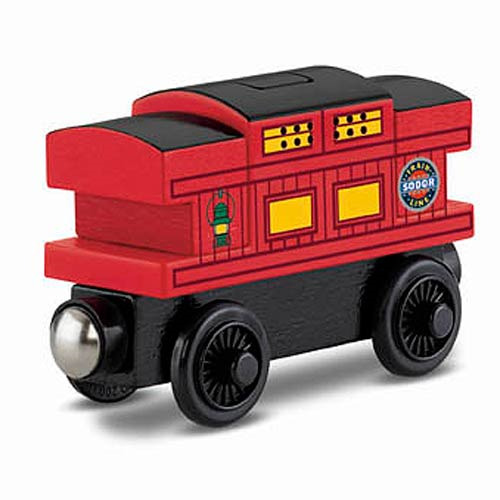 In the world of Thomas the Tank Engine and Friends Sir Topham Hatt rides around in a musical caboose, and now you can collect your own with the Thomas the Tank Engine Musical Caboose Wooden Railway Engine! The Musical Caboose Engine works great with any Thomas and Friends Wooden Railway set and provides endless hours of play. Contains easy-to-use magnet connectors that connect to other engines. Push the Thomas the Tank Engine Musical Caboose Wooden Railway Engine along the track for hours of fun! Measures about 3 1/2-inches long. Ages 2 and up. Requires 2x "LR44" button cell batteries, not included.